Soon Garden’s Gate will be transformed by our Bedding Department. There, you will find yourself lost amongst vibrant cyclamen, amaryllis, Christmas cactus, fragrant Paperwhites, ivy topiaries and more! As of now, we have Cyclamen galore! 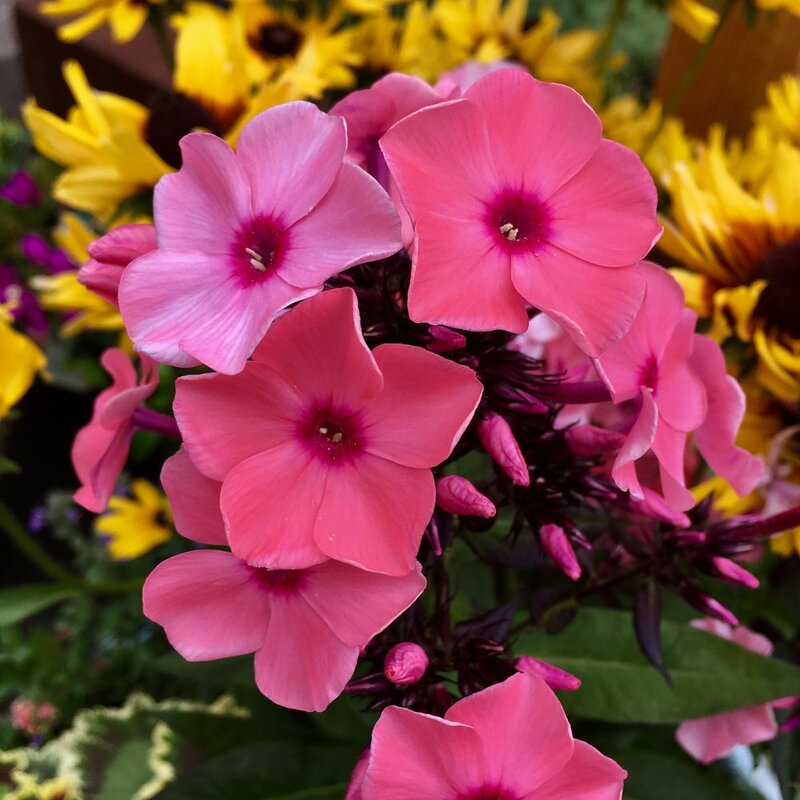 Resembling a shooting star and typically blooming in shades of white, maroon, pink, purple and red with often two-tone or ruffled petals, it’s one of our most popular flowers this season! And deer resistant too! Cyclamen are tubers that go dormant in the summer (if not receiving adequate amount of water) then the fall rains will bring forth new leaves. As the days shorten, the buds will begin to form. Adorn your table centerpiece with one of stunning cyclamen, just ensure your container has good drainage and plenty of good bright light. Remember that they like it a little bit cooler so a north-facing window or cooler part of your home is ideal. Outdoors cyclamen like shady, woodland areas but also do well in containers. They are not particular about soil types and do not mind root competition. Therefore planting them under trees and conifers for a pop of color works wonders. They like to be watered well and then left to dry out. 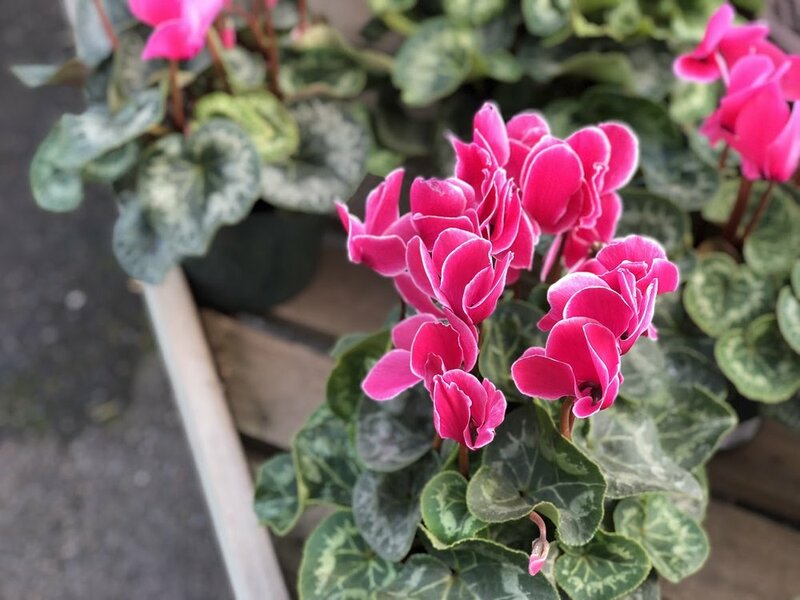 If kept too moist, cyclamen can get a fungus known as Botrytis or gray mold, and the base of the stems turn soft and mushy and the leaves fall off easily. Fertilize your cyclamen with Master Bloom 0-10-10 or E.B. Stone Organics Ultra Bloom 0-10-10 every month during the growing season. Cyclamen are one of the few winter blooming plants that are deer resistant, and add that spark of bright color during those dreary winter days - so plant away! Stop in and see what color winter has to offer your garden today! Native to North America, marigolds are grown all over the world. They've been used in religious ceremonies by the Aztecs, spread by Spanish and Portuguese explorers, made into dyes, garlands and garnishes in India and Pakistan and nicknamed "Mary's gold" in Europe in reference of the Virgin Mary. Easy to grow, it's no wonder why and how they spread around the world. Once established, marigolds will bloom summer through fall. Plant now and enjoy rich color, plus the flowers and buds are edible! Incorporating marigolds into your feasts can lend a range of flavors from spicy to bitter, tangy to peppery. Our selection from Sebastopol-based Sweetwater Nursery come organically grown in a range of colors and sizes. Read on to learn what varieties you'll find in the nursery. And hurry in, they're going fast! 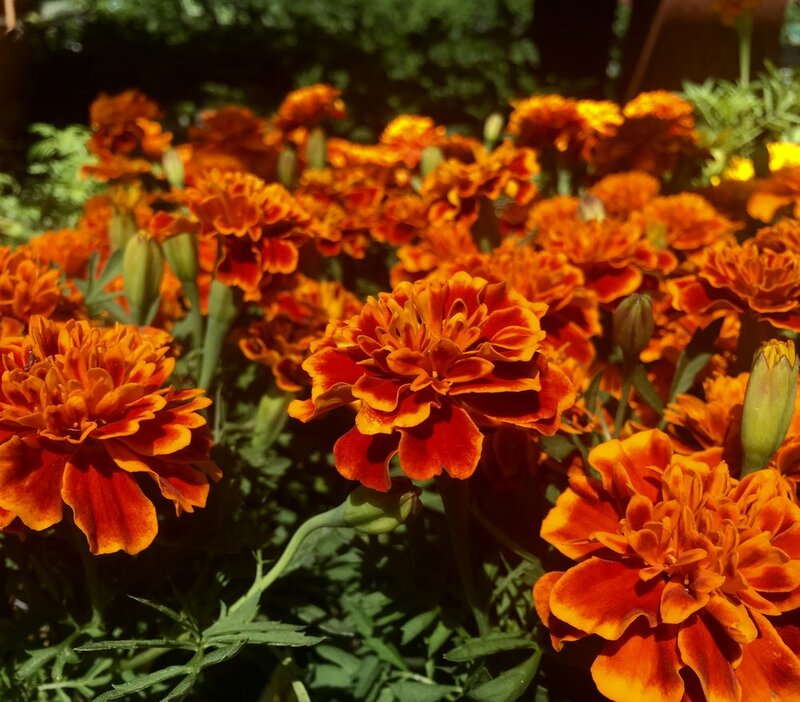 Widely considered as one of the best tasting marigold varieties. 'Lemon Gem' is an old-fashioned Signet type. It's finely cut foliage forms 8-10" mounds covered with single yellow blooms all season. Does best in the sunshine. A lovely compact French marigold with a dwarf growth habit. Plant in sun and enjoy fragrant flowers and scented foliage. Heat and frost tolerant - what more could you want?! A French marigold mix of fire yellow and orange. Enjoy bold colored flowers that are great for cutting with dark green fragrant leaves. Easy to grow, plant in sun to part sun. Boasts early blooming large, fully double crested flowers with superior uniformity. This dwarf variety does great in containers in sun. Here's a mouthful - Compact, bushy, upright, dwarf crested French marigold! This beauty grows 10-12" tall with large 2-3" blooms. Space each plant 6-10" apart in full sun. Don't worry - they can take the heat! Stay tuned - we will have more edible flowers on their way! Our stock of fall color is beginning to arrive! Now is the perfect time to plant your cool season bloomers for vivid color through fall and winter. For the best selection, stop in Friday afternoon and shop our newly arrived beauties! 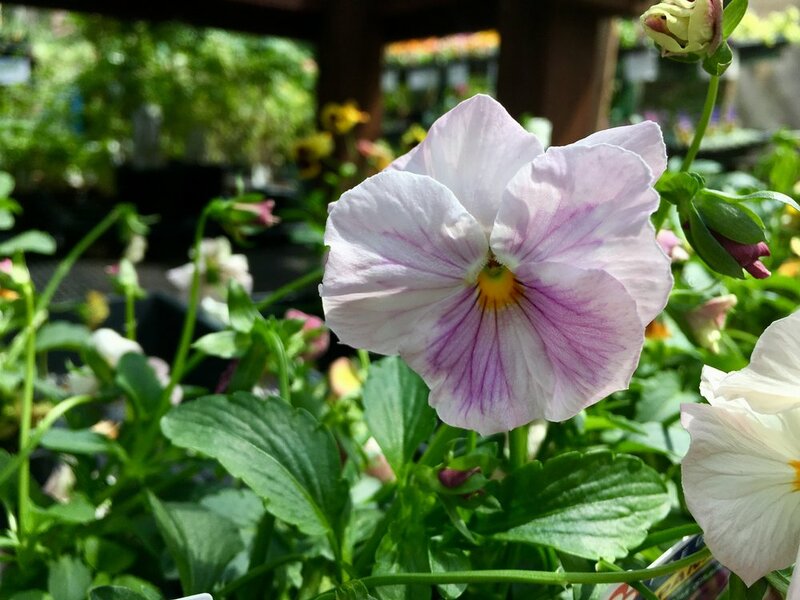 A sure source of bright color from fall through late spring, these easy-to-grow, old-fashioned favorites are available in dwarf (10-15”) or tall (18-24”) forms. Effective in borders and massed beds, they are also wonderful in containers! Great as long-lasting cut flowers, grow and decorate your fall table centerpiece with these vibrant yellow-orange blooms. Remember to remove spent blooms to prolong flowering! Calendula prefers sun, good drainage and moderate, but thorough watering - avoid overhead watering if possible. Free-flowering violas are perfect for all those hard-to-fill gaps in your winter border! Plant for edging, massing, accent, container and spring bulb cover. Hardy, compact blooms are guaranteed in our mild winters! More heat resistant than pansies, violas will bloom winter through summer from fall plantings. Sun or light shade. (Partial summer shade in our hottest areas!) Plant in rich, moist soil with regular watering and fertilizer. 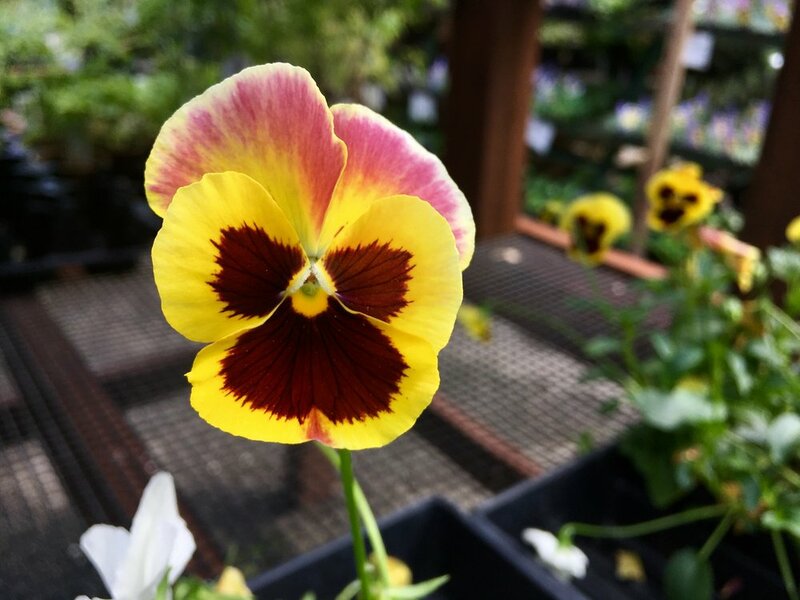 Pansies provide easy and dependable color in mass bedding, border or container plantings. Plant now for winter and spring blooms, they make a great for a spring bulb cover! Choose a spot in sun or light shade, these beauties prefer rich, moist soil with regular watering and fertilizer. Don't forget to keep spent flowers picked off to prolong blooming! For those dreary months, there is nothing better than cheery primroses! These outstanding plants are noted for their large, showy, abundant flowers of vivid color on dwarf plants. A hardy perennial often grown as an annual, Primroses reach 4-6” high and are excellent for accent, woodland border, edging or container plantings. Very cute in straw baskets! Plant in morning sun or light shade; loose, well-drained soil and moderate watering. Remember to remove spent blooms and stems to extend blooming time. A tasty way to add color to your fall and winter garden, these hardy annuals feature attractive, edible foliage. Use for mass beds, accents and pots - their leaves also make a beautiful garnish for buffet plates. (And the colder the weather, the better their color gets!) The large, 8-10” “flowers” are brightly colored in white, cream, rose or purple. The big difference between the two: Cabbage leaf edges are not fringed like Kale. Plant in sun, well-drained, fertile soil and average watering. For fragrance in the garden, and the house, Stock is second to none. Plant it near an entry and treat yourself, and your guests, to its delightful perfume - most noticeably on cool, overcast days, and at twilight. Stock prefers moist, well-drained soil, and sun or light shade. 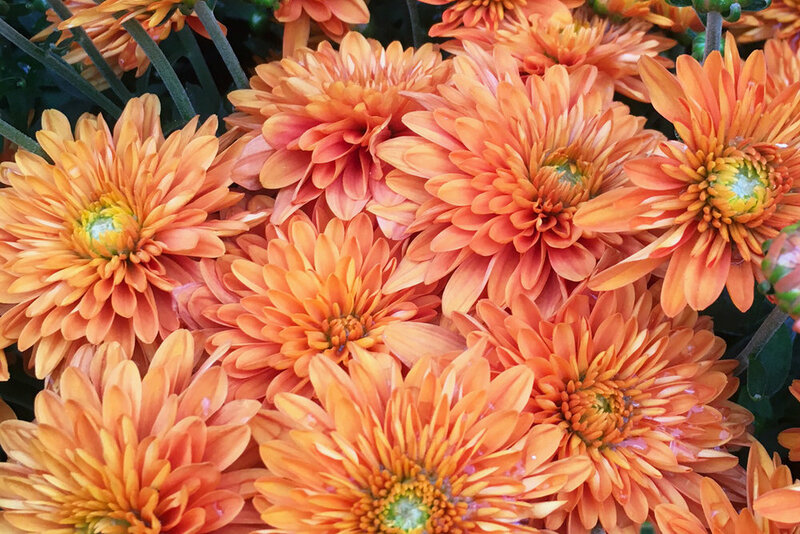 A fall favorite, plant Chrysanthemums in sun or light shade and enjoy an assortment of colors and forms all season long! We love planting Mums as borders, edging and in containers for an abundance of free-flowering color. Mum's the word, and if you missed it on our newsletter, be sure to sign up here! For all your fall color, we recommend planting with Master Nursery's Eureka Planting Mix, now on sale thru the month of September. (Buy 3 and get 1 free!) Upon planting, don't forget to fertilize! Apply E.B. Stone Organics Sure Start 4-6-2, a starter fertilizer that will help your plants develop sturdy roots and healthy growth.